Dear Friends, I am distraught that the final edition of the MLMB did not go out properly this past weekend because of technical glitches. The show can be heard on line by clicking on the search button on the RCI website and writing in "Maple Leaf Mailbag." Then hit "programs" and click "listen." I shall never forget you. Be well, everyone. Au Revoir and peace! 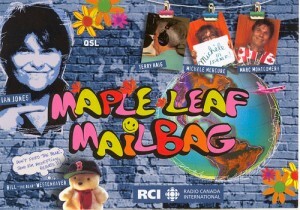 Terry H.
I should note that, the Maple Leaf Mailbag was one of my favorite RCI shows to catch on shortwave. It was informal, quirky, interactive and always fun. It also had a very strong international listenership. Terry has been an excellent sub, but admittedly, I've really missed hearing my good friend Ian Jones on the show.